Description: Elegant scroll invitation box made of green texture card has a creative laser cutout in the centre. 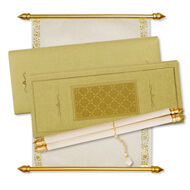 Inside the box is a cream non woven scroll with gold foiled borders and gold sticks pasted. The box comes with a matching envelope.